Both the World Health Organization and government advisers in England have recently proposed a cut in their recommendations for sugar consumption. The new advice is that it should account for 5% of energy intake - down from 10%. But a study published in the BMC Public Health journal suggested the target should be no more than 3%. The researchers - from University College London and London School of Hygiene and Tropical Medicine - said the move was needed after looking at the cost in both health and financial terms of tooth decay. They said sugar was the most important factor in the development of tooth decay and because of that it was a "largely preventable disease". 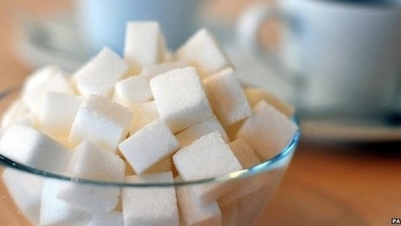 The study said an increase from near-zero sugar to 5% of energy intake doubles the prevalence of decay in children, The treatment of dental problems costs between 5% and 10% of total health expenditure in industrial countries, it added. Report co-author Prof Philip James, a nutrition expert at the London School of Hygiene and Tropical Medicine and past president of the World Obesity Federation, said tough action was needed. Sugar tax He called for vending machines offering confectionery and sugary drinks in areas controlled by government, such as schools and hospitals, to be removed. Action on Sugar campaign group, which has been calling for tough measure to combat sugar consumption.